Jack Nicklaus receives The Don Shula Sports Legend Award presented by Tony Fiorentino, Don Shula, Ron Book, Don Shula, and Eric Reid. 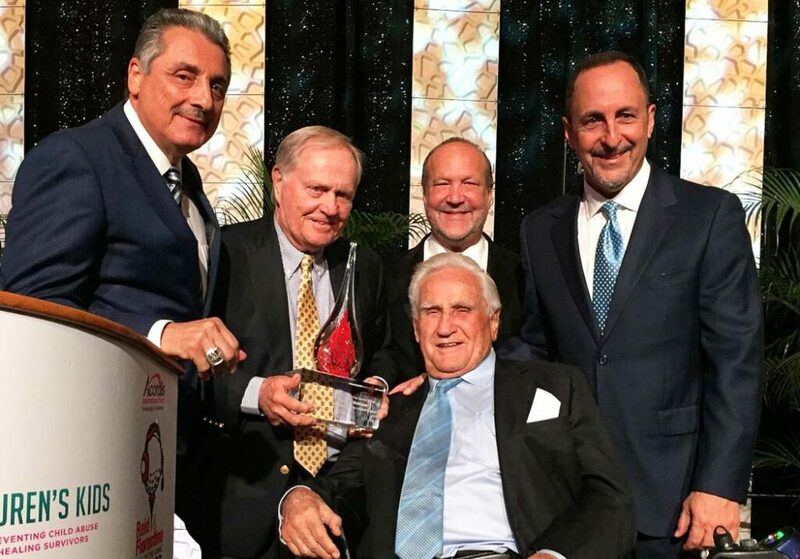 Jack Nicklaus accepted the Don Shula Sports Legend Award at the 11th Annual Reid & Fiorentino Call of The Game Dinner on March 10 at the Seminole Hard Rock Hotel & Casino in Hollywood, Fla., outside Fort Lauderdale. The Don Shula Sports Legend Award honors an outstanding sports legend who has demonstrated a passion for their sport and brings that same passion to their community. Nicklaus is a record 18-time major champion, as well as a businessman, philanthropist, and goodwill ambassador. He is just the 16th individual in U.S. history to receive both the Presidential Medal of Freedom and the Congressional Gold Medal—the highest honors that the President of the United States and Congress, respectively, can bestow on a U.S. civilian. Nicklaus is the founder of the globally recognized golf course design firm Nicklaus Design, and also has a successful marketing and licensing business. But off the golf course and outside of the boardroom, the Golden Bear is known as co-founder, along with wife Barbara, of the Nicklaus Children’s Health Care Foundation, where they work tirelessly for pediatric healthcare in South Florida and other parts of the country. In 2015, Miami Children’s Hospital and its network of outpatient centers were rebranded to Nicklaus Children’s Hospital. The Nicklauses continue to find innovative ways to raise money for children’s healthcare, whether through the Memorial Tournament presented by Nationwide on the PGA TOUR, or through their many products that support charity, including Nicklaus Golf Balls, Jack Nicklaus Ice Cream, Jack’s House Wine, the Jack Nicklaus Golden Bear Grill, and others. Past winners of the Don Shula Sports Legend Award include Pat Riley (2016), Dan Marino (2015), LeBron James (2014), Ron Rothstein (2013), Bob Griese (2012), Alonzo Mourning (2011), Dr. Jack Ramsay (2010), and Coach Don Shula (2009). “I was a season-ticket holder with the Miami Heat for many years, and I have been a season-ticket holder for the Miami Dolphins since day one,” Jack Nicklaus said. “But my love and support for the team took root when the Dolphins took shape under the leadership of the man I have long admired and respected, and the man for whom this award is named—my good friend Don Shula. Friday night’s fundraiser once again attracted some of the region’s biggest names in sports and entertainment, while honoring the achievements by some of the today’s most acclaimed community leaders. Among the more than 800 guests in attendance was a who’s who of former Miami Heat and Miami Dolphins players, including NBA Hall-of-Famer Alonzo Mourning, Heat coach Erik Spoelstra, and Nicklaus’ close friend and Miami icon, former Miami Dolphins coach Don Shula (1970-1995). The evening was hosted by Emmy Award-winning WPLG Local 10 Anchor Calvin Hughes. Also recognized at the special event were former Miami Dolphins player Kim Bokamper (Sonny Hirsch Excellence in Sports Broadcasting Award Honoree); business leader and philanthropist Art Hertz (Ted Arison Community Service Award Honoree); and world champion swimmer Diana Nyad (Jim Mandich Courage & Commitment Award Honoree). The event celebrates and pays tribute to sporting heroes and community leaders benefiting Lauren’s Kids and Dade Schools Athletic Foundation. Lauren’s Kids seeks to end child sexual abuse through education and awareness and help survivors heal through guidance and support, while the Dade Schools Athletic Foundation is a nonprofit organization created through the Miami-Dade County School Board to allow the private sector to support and augment the Miami-Dade County Public School system’s athletic programs. In addition, the DSAF annually provides scholarships for outstanding student-athletes.